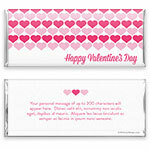 Celebrate in sweet style with this heart-covered candy wrapper. Design: Light and dark pink Valentine hearts pattern. Personalization: Front greeting with a back message.